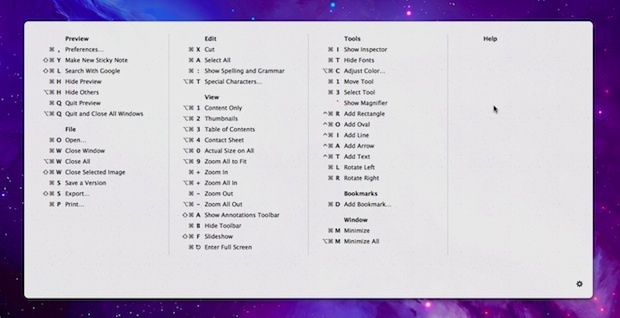 There are so many keyboard shortcuts throughout Mac OS X and it’s myriad of third party apps that it’s easy to forget them or get lost trying to memorize the sea of keystrokes for each app. This is where CheatSheet will make your life easier, it’s a tiny free application that sits in the background waiting to be summoned from any app to instantly show all keyboard shortcuts for that application. After you’ve downloaded CheatSheet, place it in /Applications/ folder and the launch the app. Now from any application, hold down the Command key for a few seconds to summon the “Cheat Sheet” list of all keyboard shortcuts for that app. This allows you to quickly see even the most obscure shortcuts that would otherwise be buried deep within a submenu somewhere. Quick troubleshooting tips: if some apps aren’t responding to the hotkey, either relaunch those apps or try releasing and holding Command again and it should activate. Also if you’ve forgotten the meaning of Mac keyboard symbols it may be a good time to review those really quickly. My only complaint about CheatSheet is that since it runs in the background you have to use something like Activity Monitor to easily quit out of it. Having an optional menu item to summon the cheat sheet for the active application, give you some control over basic settings like response time, and having a quick way to quit CheatSheet would be a nice touch, but this is a free app that is very useful as is so we really can’t complain too much. Whether you’re a longtime Mac user or completely new to the platform, you are practically guaranteed to find CheatSheet useful. Get it now and thank me later. You can quit by clicking on the little gear icon at the lower right corner while holding down the cmd key, then choose quit. My complaint is that it pops up when I do app switching with cmd+tab. How ’bout them keystrokes eh? @Mitford: Nobody cares, and that typo makes you look pretty damn foolish. Actually, quite a lot of us care. The standard of written English on the Internet is declining and misuse of the apostrophe, especially “its and it’s” is one of the most common mistakes. I agree. In many cases, the misplaced, or missing, apostrophe makes all the difference to the sense of the message. Where’s the improper apostrophe? I can’t even find it. Eric, you can’t complain about grammar when you don’t even know how to use comma correctly. It’s for the “How to Create a Disk Image of an Entire Mac Hard Drive”. This is really cool! Thanks for the post. If you mostly use the keyboard for navigation, you will surely like it. You really have to hold it down for three seconds so it doesn’t get in the way of the alt + tab etc. Good thing I got here after the grammar police. It-‘-s a joke how uptight a-holes are on the ‘-net. Get over yourselves. all i get is a system preferences window with the universal access panel. anybody have any ideas? steev: go to system prefs>universal access and enable the radio button at the bottom left like in the screenshot. Would be awesome if you could change the delay on this to your liking. 3 seconds is too short sometimes. how much cpu does this thing use while its in the background? Virtually nothing, 0.2% in my test. Or how about an option to change the hotkey to a custom or custom combination? That would be nice. I love this thing, but is there a way to keep it from popping up when you cmd-tab from app to app? While this is useful, it is less useful to me because it uses icons that are no longer on mac keyboards, other than on the command key. In fact I have never owned a mac with those symbols and when I see just them it annoys the hell out of me. Why do devs do that? How do I delete/uninstall it? thank you. How do I close it and then uninstall/delete it? Please? Go to Activity Monitor. Find the CheatSheet process and quit it. Who and where to condense this summer on festival, slice your information. Such documentation details are important, for instance to someone reading this article one year from now. Please don’t think only about yourself.